ExcoLight Basic, the Exceptionally Complicated light. 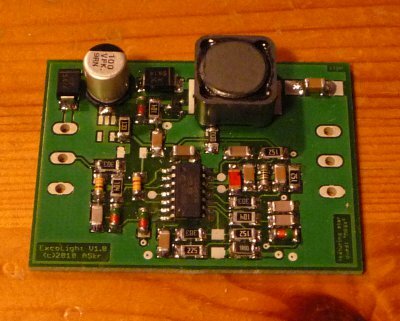 A bus-capable PWM LED driver. ExcoLight, whose "light" version (pronounce: "reduced") is presented here, is a bus capable LED lighting device. The light version operates on a 3-wire bus (the pro version uses only 2) and every module can be controlled separately. Basically, it operates as a bus-controllable buck converter. Cables can directly be attached to pluggable screw terminals, but the PCB can also be used as a module itself (terminals, with attaches cables, fitted elsewhere...). As presented here, the hardware should be a fair compromise between cost and component count/complexity. 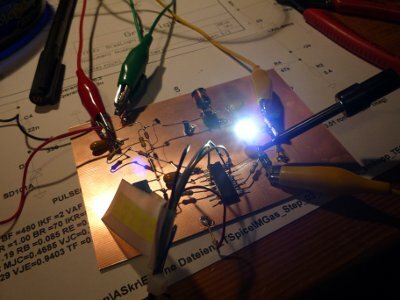 Although the hardware got (a little ;-) more complex than planned, the selected parts are cheap (<<0.2€), except for the LED (2-15€), the PCB (2-5€), a PIC (0.5-1€), several Cs (0.5-1.5€) and a coil (0.3-0.8€). The main part of the circuit is a PIC 16HV616. The "HV-devices" contain an integrated current sink at the Vdd pin and can therefore be attached to high voltages via a single resistor. The internal sink will lower the voltage to ~5V. This is simple, but not very efficient. Usually, the current consumption of the HV-PIC's sink (1-4mA), leads to a loss of 10-30% in efficiency, compared to the LED current (0-400mA). The PIC can handle a PWM up to a frequency of 200kHz, at only 5 bit resolution. A free running oscillator could go much faster, helping to reduce the size and cost of the inductor, but none of the "unusual" or non-standard topologies provided the demanded feature set (true LED-current programmability, low ripple, stability/safety, ...). At the end, the standard current regulated buck-topology won. The chosen design makes use of some sophisticated "PIC-only" features (although these days, Microchip is not the only company that built in analog components). With power coming in from D1 (can be omitted if you are ABSOLUTELY sure you will never ever reverse + and -), the buck regulator is formed by T1, D2 and L1. Two multi pads for the buffering capacitors C2 (input) and C1 (output) allow placement of 1206 ceramic, several tantalum and electrolytic capacitors (6mm diameter), depending on component height, cost or availability. Both Cs should be low ESR types (higher price) and their values as large as possible (even more money ;-). C1 should at least(!) be 47u (100-330u preferred) at a voltage rating of 6,3V (...). 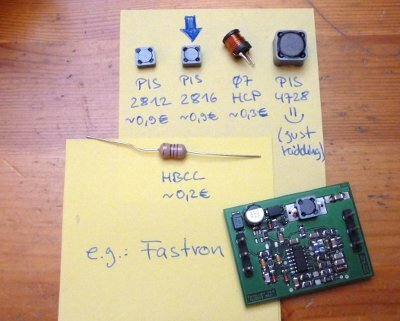 An HV device only needs R2 as a series resistor. R2's value should be chosen as large as possible, to reduce the current consumption, but at least the PWM output on pin 5 needs a sufficient power supply. The proposed values (3k3 for 15V and 5k6 for 24V supply) are "safe", but not very efficient values and may still be increased. If you don't know how to calculate this: Keep your hands off it! For lower current consumption (BUT ONLY 15V SUPPLY! ), an LT1761 can be chosen as an alternative power supply. WARNING: THIS REQUIRES A 16*F*616, not an HV-type! While they can be turned on very quickly, the turn-off time suffers from the lack of a "push stage". ExcoLight's high current switch T1 is operated in an AC mode. If no PWM pulses, coming out of pin 5 of the PIC controller, are present, R1 keeps T1 closed. The PWM is AC coupled onto T1's base, with D3 acting as a bootstrap diode, hindering the voltage from building an arithmetic mean (+-2.5V across T1's base), but limiting it to +0.3 and -4,7V. Quick changes of, or long-lasting spikes on, the input voltage can turn on or off T1 too. With one exception, the initial engaging of the circuit (aka. : power on), this is nothing to worry about. 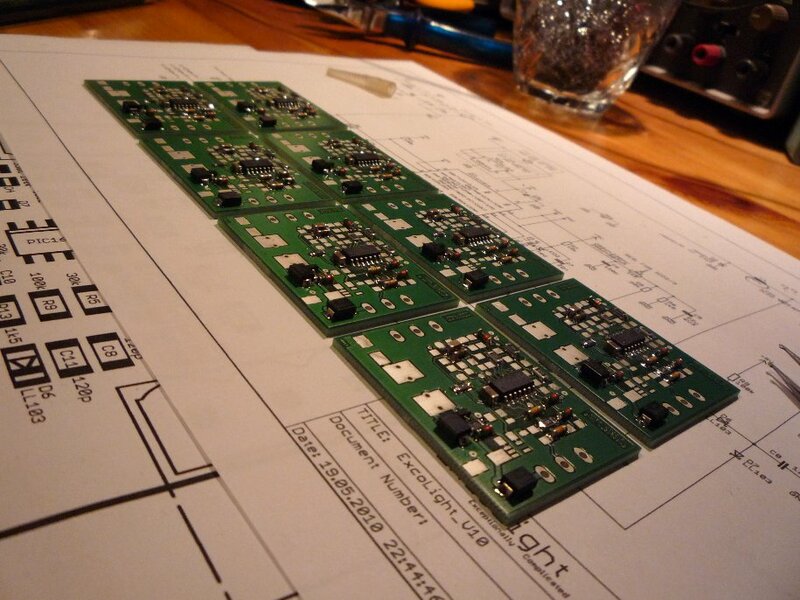 The input capacitors will filter out most of it. But, at least powering on the circuit can result in a short and bright LED pulse. The faster the voltage rises,	the brighter the pulse (...). The PWM is operating at 200kHz, the maximum value the PIC can output with its internal oscillator at 8MHz, with a fixed duty cycle. Although the latter value is hard-coded in the firmware, it can be changed via the communications protocol. 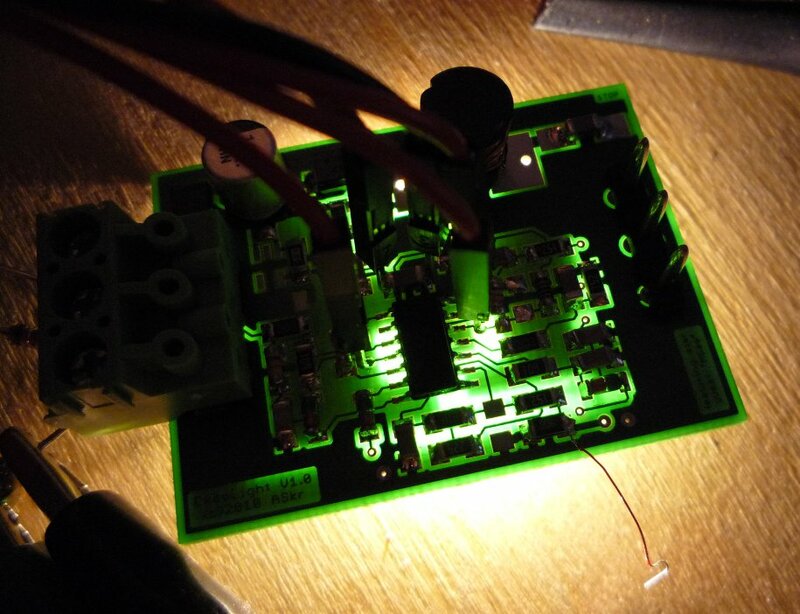 This allows tuning towards the maximum efficiency for the selected components (LED color, inductor, capacitors). Instead of varying the duty cycle, which would only be possible within 5 lousy bits @200kHz, the PWM is turned on and off by one of the PIC's internal comparators. The set value is created by a second, manually coded PWM coming out of pin 11. The PWM is filtered (R5, C5), reduced (R5, R6) to ~1mV per digit and fed to pin 13, the positive input of the comparator (C1IN+). The negative input, pin 9 (C12IN-) is connected to the shunt (R14), measuring the current that is actually flowing through the LED. Whenever the voltage across R14 exceeds the set value, the PWM is turned of immediately, even if the pulse has just begun. To make it even faster, the comparator's hysteresis is turned off. Because of the comparator's input offset (+-5-10mV max), the LED may still be lightly dimming, although we told it to stay off. This happens if C1IN+ is greater than C12IN-, including the offset. 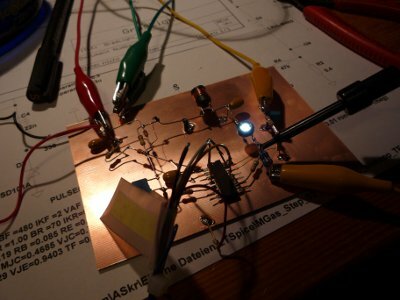 As a compensation, R11 simulates a little LED current, resulting in a voltage of about ~3,7mV. If the LED still refuses to shut off completely, reduce R11 (1M8 -> 4,1mV; 1M5 -> 5,0mV). Pin 8 (AN6) is configured as an A/D input. The LED current, as seen by the comparator at pin C12IN-, is filtered by R15 and C12 (creating an arithmetic mean) and measured. The waveform across R14 is not truly symmetric, hence the arithmetic mean contains a little offset compared to the real LED RMS current. If you chose a good (low ESR; high capacitance) C1 capacitor, which results in a lower ripple across R14, the difference between bus-commanded current (e.g. : 150mA) and real LED current will be negligible. Unfortunately, the PIC's internal 10bit A/D converter can not select any other reference but Vdd or the Vref pin. Choosing Vdd would results in a very coarse resolution (~4,9mV/digit). With R14's value of 0E49 (may be increased for better resolution and finer dimming at cost of efficiency), a current of 500mA will result in a voltage of 250mV, which would then be represented by lousy 51 A/D digits (from a total of 1024). To increase the resolution of the A/D converter and keep the firmware simple (at least in it's current stage), the external Vref pin is connected to a voltage of ~1.03V (1.024V ideal), created by a filtered resistor divider (R7, R17, C7). Only the 8 LSBs of the A/D result are evaluated: 1,024V/1024*255=255mV, which results in an LED current of ~2mA per commanded digit (Iled = Ur14/R14). After a new LED current command is received, the firmware constantly compares the set value (commanded value from bus) to the measured A/D value and then gently increases or decreases the PWM generated trip point value at pin C1IN+. 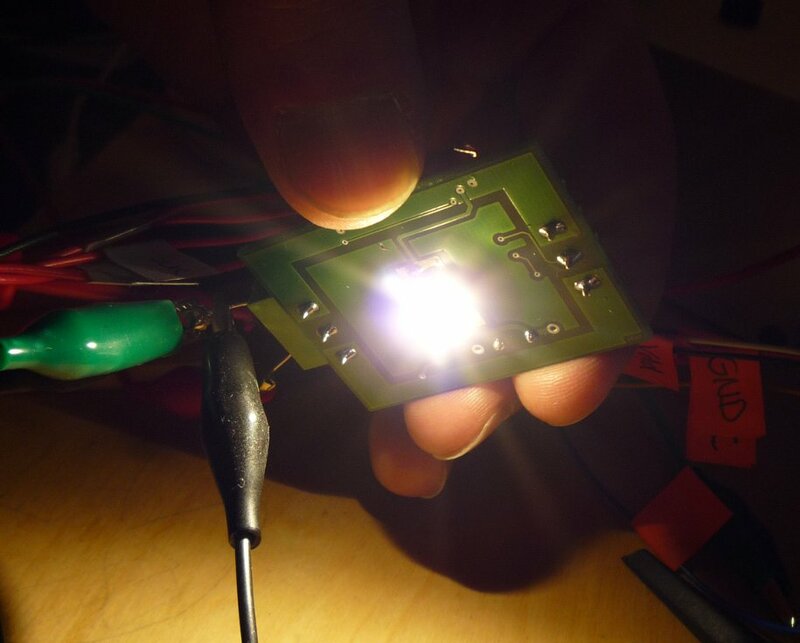 This results in a slowly changing brightness of the LED (*1*). (*1*) This second, overlaying regulation mechanism is temporarily disabled in FW V0.5. Improper PWM values or selected components might lead to a annoying flicker for very low currents (light dimming LEDs). The higher the inductance and output capacitance value, the lesser the current ripple and the better the performance. Unfortunately, costs and size rise with both too. The universal "L" and "C" footprints allow a wide selection of inductors and capacitors. Usually, fully capsuled ("magnetically closed") inductors should be preferred. The selection of the output capacitor is critical to LED ripple current, stability and LED life (*2*). The footprint allows SMD components of size 1206 up to 6.3mm AL caps. Standard electrolytic capacitors are not suitable for switching regulators. Do NOT use standard tantalum capacitors unless you know what you are doing! 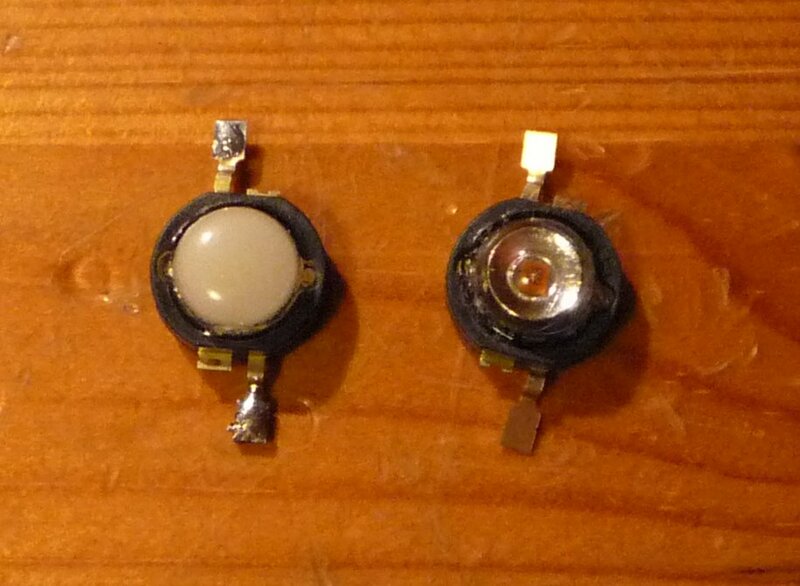 (*2*) High power LEDs do indeed not like large current ripple (reduces life time -> less output). Forget about "WATT", the most interesting specification is "LUMEN PER WATT". Standard ExcoLight Basic configuration allows up to 500mA LED current (1-3W LEDs). Nowadays (8/2010 ;-), CREE and Seoul (Acriche) offer the most advanced (white) LEDs available. There is no restriction on LED color, as long as the diffusion voltage is below 5V. This allows two red, green, amber or yellow and one blue or white LED(s). Two LEDs won't fit onto the board, you can attach them via a short(!, <<10cm), twisted(!) wire. The standard ExcoLight bus topology is a daisy-chained loop configuration. All three output terminals of a module (+UBin, GNDin, COMMin) are connected to the corresponding inputs of the next module. The first and last module need to be attached to one of the master control modules (MCM). This way, a maximum of 126 ExcoLights can be connected to the loop. Each of them gets a dynamically allocated, unique (*1*) address (1-126) on power up. Addresses 0 and 127 are reserved for a wiring detection mechanism and a broadcast command. (*1*) Actually, the restriction of an unique address can be overridden by software and hardware (bus topology). The software of the master control module may assign addresses of whatever value (e.g. 126 equal addresses), but a clever wiring can do the same without any bits or bytes (see below). Communication is bidirectional, half-duplex and of a "host"-"device" type. The master control module (host) initiates all transfers. No module (device) sends any telegram on its own. Outgoing from the master control module (Q1/Q2), any sent command (TX FWD) sequentially passes all modules 1, 2, 3..., until it returns to its origin. An answer from any of the modules is sent to the same direction. Hence the two ends of the loop can be regarded as a "TX input", feeding module #1, and "RX output", coming out from the last module. Multiple modules, namely all of those whose address is equal, will respond to the same command(s), which comes in handy for areas of equal brightness and additionally reduces the traffic on the bus. Note 1: Only inputs can be shared. Do not interconnect outputs! Note 2: Answers from modules, whose output terminals are not connected (stubs), won't go anywhere. The second figure illustrates ExcoLights internal "forward TX/RX" loop mode. The input "RXIN" is driven by an open collector "pull-only" output stage (previous module or MCM), with a software UART listening for any communication. On power up, all modules start with an address of "0". The output of the PIC's internal comparator is turned off, hence only the first module is able to receive a command from the MCM. After receiving its new, valid address, the output of the comparator is turned on (Note: The output is inverted internally, thus the output signal is identically to the "-" input). As of then, the comparator acts as a repeater and forwards any incoming telegram to the next module. "CVref" is internally connected to the PIC's voltage reference module, which provides an adjustable trigger level. Diode D7 converts the comparator's push-pull output to a pull-type (open collector), as required by the next module. If modules are wired in parallel (stubs), the initial "NEW ADDRESS" command will be executed by all of them (all started with address "0"). Sometimes, a loop configuration can be inappropriate. E.g. if the last module is far away from the master control module. To overcome this restriction, the ExcoLight bus also supports a "backward RX" mode. Instead of sending its answer to the output terminal, the direction can be reversed (by software). Instead of a loop, the complete bus can now be wired as a stub, with TX and RX residing on the same side (module #1). Instead of sending its messages out through the comparator, the software TX UART can be fed to pin "TXIN", which will then pull "RXIN" low via D4. Note: In this mode, the comparator's output is disabled. Otherwise the message would get sent in both directions. (*2*) Because all modules with the same address answer at the same time, the result is unpredictable. Note: Byte with "new address" security code (0xAA) was replaced by 2nd address. LED will be turned on only if the commanded value is greater or equal "minimal on"
Default is 8, can be reprogrammed with E-COMMAND and queried via GET_REG. 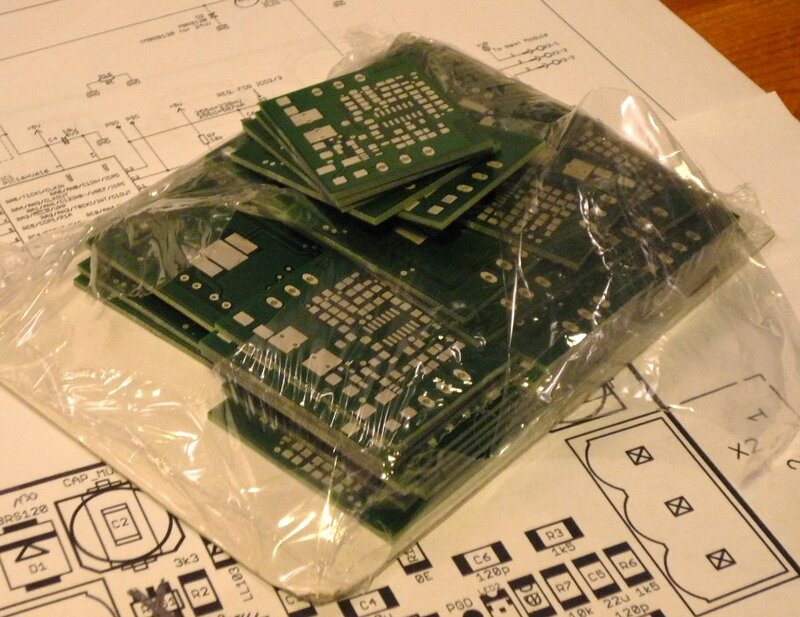 For firmware version less or equal to V0.8, allow 40ms delay between two packets. Commands marked with (A) will initiate a module answer. Commands marked with (B) might initiate a module answer. Module will output a short flash pulse. SET_ADDRESS -> Set new module address. On power up, every module starts with "0". Usually used as: To module "0", new address "n". SET_ADDRESS will make the module output a short flash pulse. Can be used as "Single Flash Mode": To module "2", new address "2". writing "0" to it, will have no effect. SET_123     -> set values of primary channels 1-3          LIGHT MODULES, ONLY! SET_RGB     -> set values of primary channels R, G and B   LIGHT MODULES, ONLY! SET_MIN_ON  -> Value at which the LED is turned on (minimal trigger value). Will be activated upon next SET_PWM or SET_123/RGB command. Availability of registers depends on module type. Commands setting or reading invalid or not existant registers will be ignored. ExcoLight can be controlled by every device, containing a serial interface, capable of handling 4800 baud (8O1). Devices with CMOS level interface, like all MCUs, FTDI, MAX232, ..., can directly be attached via a diode, as shown in the pic to the right. Until a real remote control is finished, ExcoLight (Basic, Pro and Color) can be controlled by a PC based software and a serial interface (RS-232). Note: This requires a level converter, RS-232 <-> CMOS (MAX232, FTDI, ...) and open collector out- and inputs! RX needs a 30k pull-up to Vcc of the level converter (if not already present). This little test and debug application was developed (...) with Profilab. Profilab project files as well as a compiled version are available in the download section. Here's a little Python script to play around with. It requires pySerial.